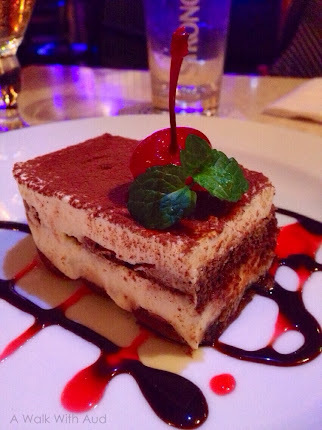 When you want something, you always have to sacrifice something in exchange. 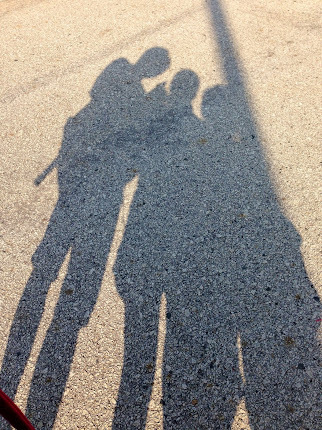 It is the iron fact that implies to everything in life. Likewise, if you want to look good in those nice looking killer heels, you gotta give up your smooth nice feet. Every woman knows that, and to my surprise many are willing to trade. 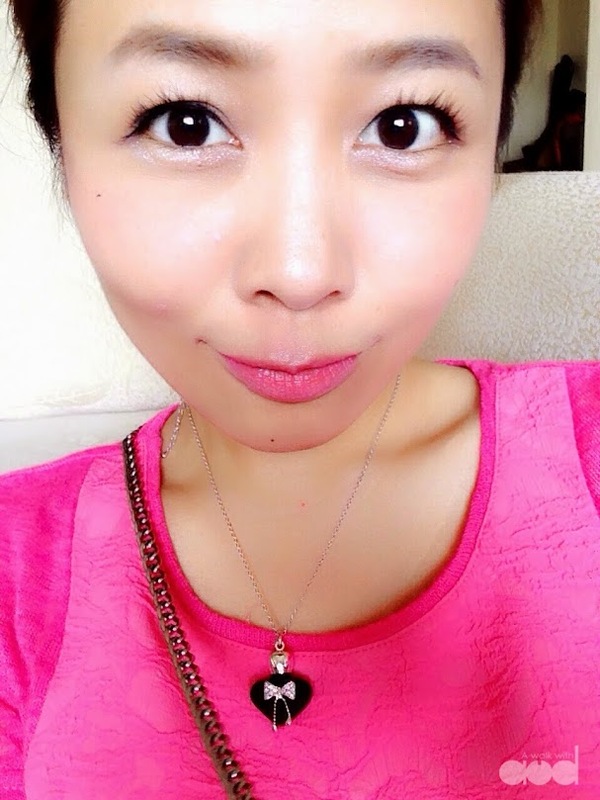 It seems like to most women, as long as they look good on the outside (parts that can be seen), it doesn't matter how bad it is in the inside (parts that are hidden). Hmm... What if I tell you that you do not need to trade your happy feet in order to rock those heels anymore? What if I tell you that from now on, you can be greedy, you can have both? No more sacrifice. Sounds good? 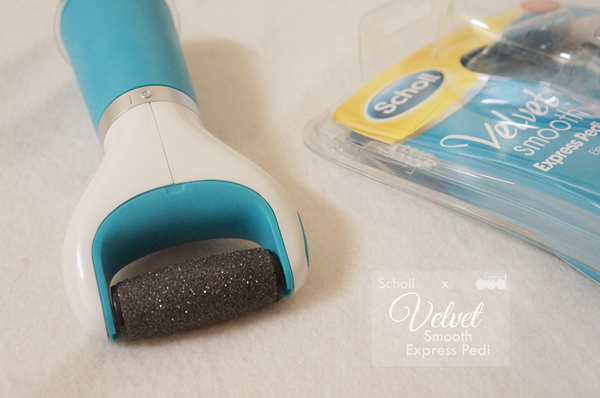 Thanks to Scholl, Velvet Smooth Express Pedi is now at your service. Scholl is a long-standing footwear and foot care brand dedicated to improve the health, comfort and well-being of people by caring for their feet. 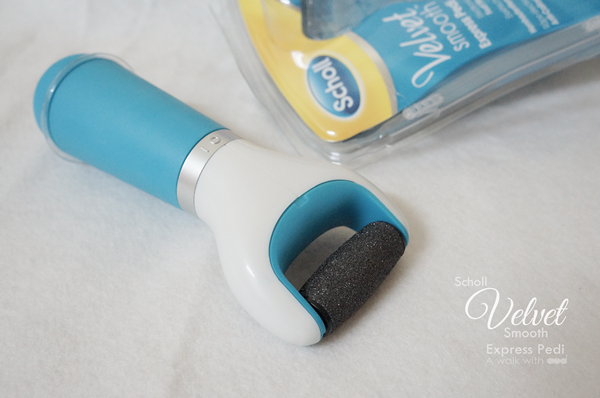 They have just launched a new product #MyVelvetSmooth which is an electronic foot file that effectively removes hard skin on the foot to help women (and men) to achieve smooth nice feet without a hassle. 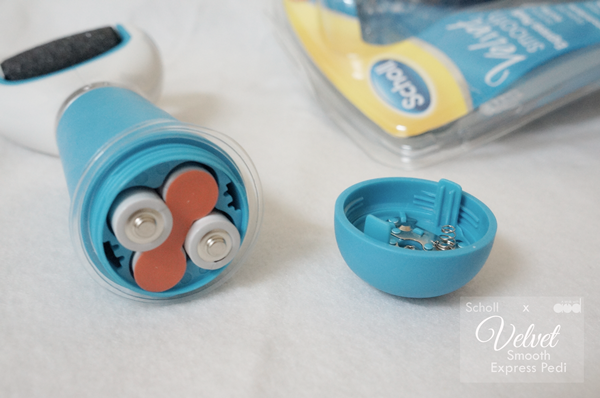 The package comes with a #MyVelvetSmooth device, 4 AA batteries (inside the device), and a cover cap for the roller (cap wasn't shown in the picture because I remove it to show the roller). Ready to check out how it works? Let's rock and Roll! First thing off, unscrew the base lid, you will see 4 AA batteries and a red insulator tab. 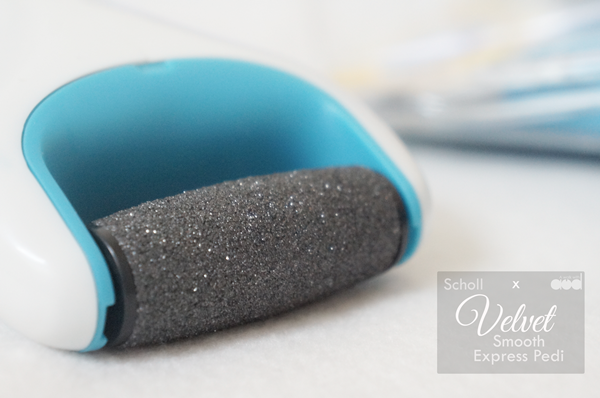 Remove the red insulator tab so that #MyVelvetSmooth device can function properly. Screw the base back and it's ready to be used. Here I use my mum's feet for demo. First it's because I want her try the good things first; second, is because I believe that it will have a clearer effect. Thank you mummy for sacrificing so much just to raise us up. I know you don't even bare to spend money to for/ maintain yourself but yet willing to spend all the money on us. Now, it's my turn to sayang you and give you all I can. To switch on the device, simply turn the switcher to "I" and turn to the "o" sign to switch it off. Now, Let the exfoliating journey begins! Mummy, just sit back, relax and enjoy okay! (She even fall asleep while I'm exfoliating her feet for her). Run the device over the needed area. Go through a few times untill satisfied. 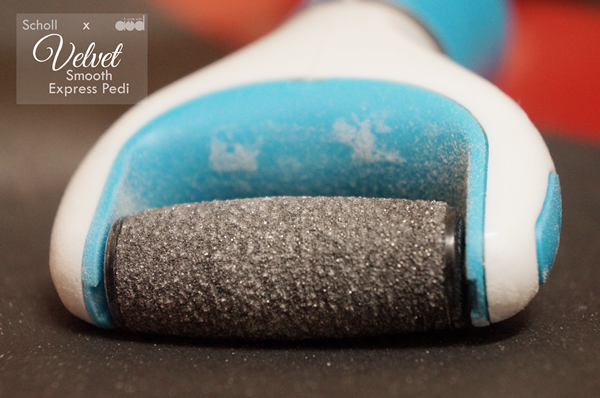 The device features a roller surface furnished with microgranulates that makes removing excess hard skin a breeze. Skin is left smooth and soft after application. The white thingy on the black card board are the dead skin and particulars. Advice to do it in the bathroom so that it won't get messy. 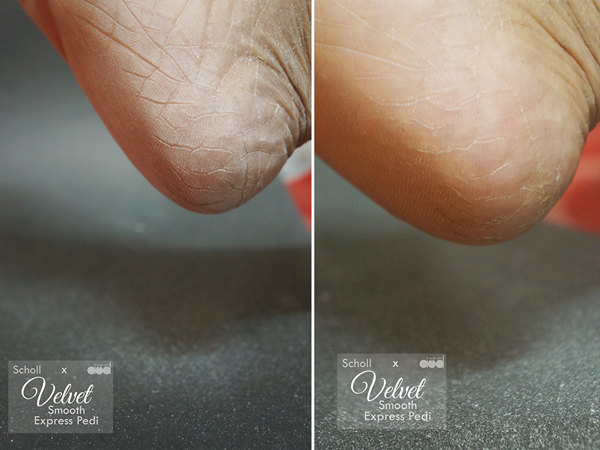 Wow, After treating mummy's feet, look at #MyVelvetSmooth device! It's so "fruitful"!! Lol. Oh ya, by the way the roller can be replaced once it's worn out. 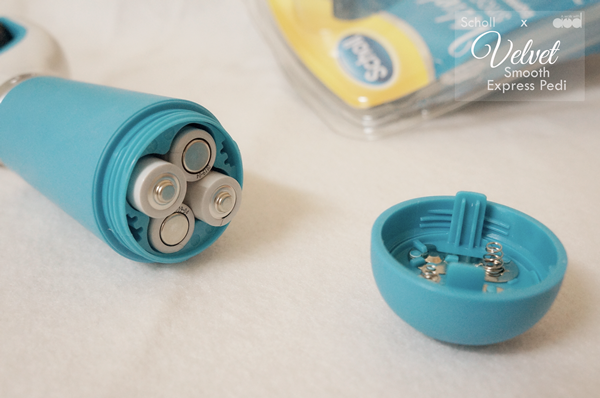 It's easy to replace, just press the blue button at the side to take it off and replace it with refill. Refill can be bought at Watson. You might be worried that it will be difficult to clean your #MyVelvetSmooth device, but don't worry, a normal wet tissue will do the job. 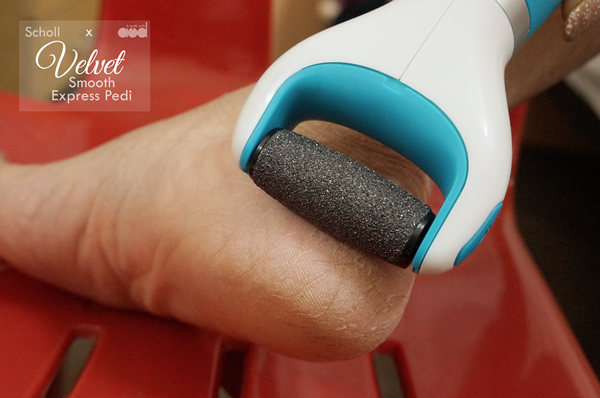 Now, With #MyVelvetSmooth, Beautiful feet starts at home with just one switch. No more hassle to salon. 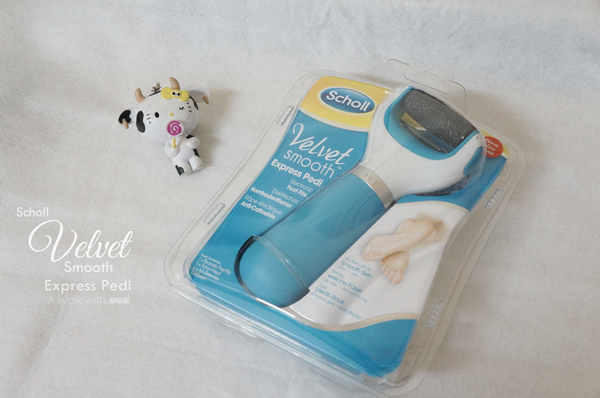 All thanks to Scholl! Wish to try before purchase? Head down to 1 Utama pit stop event (right outside Watson) from 6- 10 August for a foot pampering session. 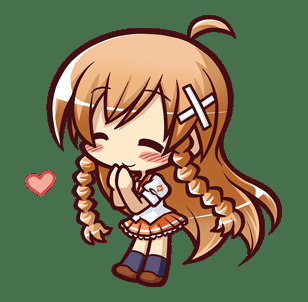 If you would like to purchase, here's a good news! A nationwide RM 10 discount for the product will take effect on the 1st August 2014. 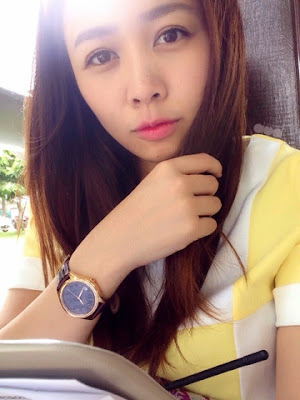 Click >>MyVelvetSmooth<< to enjoy this promotion! Woah, the result is really obvious! hai, Aud, I'm Indri from Indonesia. could I take some of the picture of Kedai kopi Chung Hwah here? 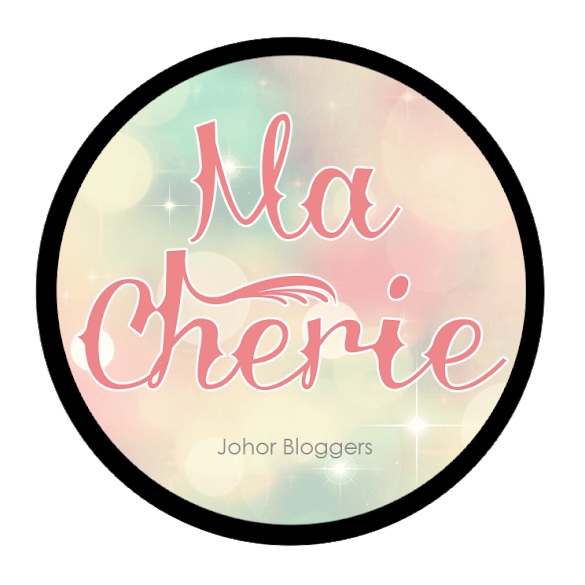 because I lost some of my picture during the transfer, and I want to use this to my personal blog. I'll give the back link to your blog also. thanks..
you can visit my blog at www.tintaktandukarsitek.com.